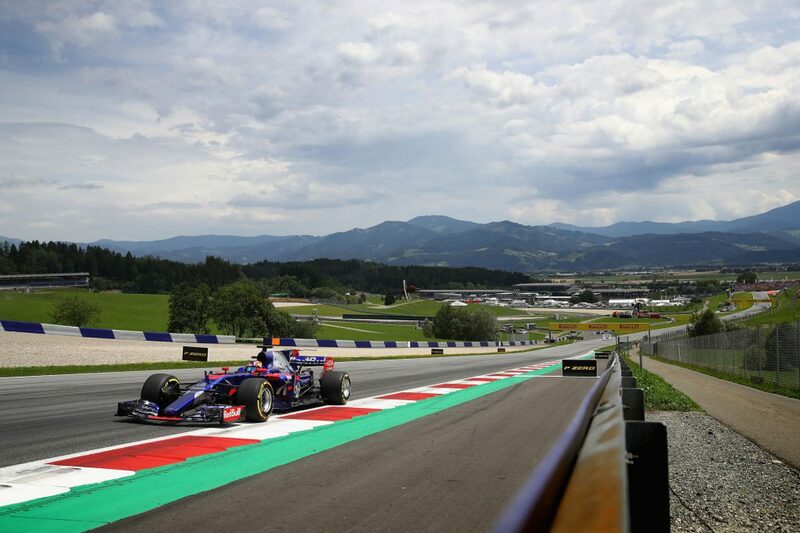 Austrian GP F1 Strategy Report Podcast – our host Michael Lamonato is joined by Luke Smith from NBC Sports. 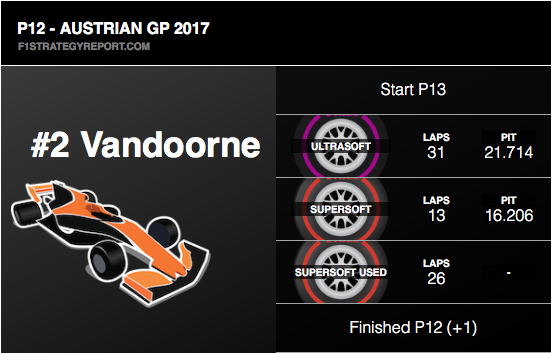 While the first and last laps of the 2017 Austrian Grand Prix were pretty exciting and action-packed, the rest of the race fell a bit flat – caused, in part, due to the lack of strategy and the durable tyres at the Red Bull Ring. Valtteri Bottas converted pole position into his second Formula 1 victory, holding off a late charge from Ferrari’s Sebastian Vettel to give Mercedes a vital win. Daniel Ricciardo brought the “shoey” back with a podium for Red Bull on home soil. Sometimes, during the 2017 season, we’ve seen the one-stop strategy be the most popular – but a few drivers have tried the two-stop, just to give it a go. 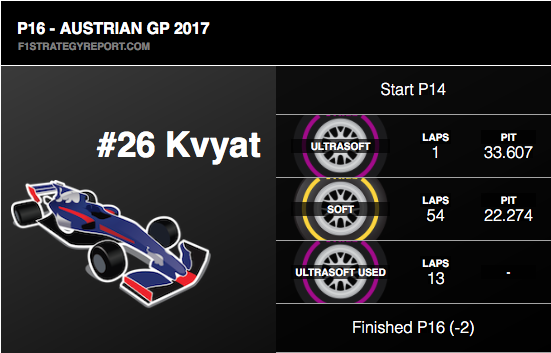 That wasn’t what happened in Austria, with all of the 16 classified finishers completing just one trip through the pits. 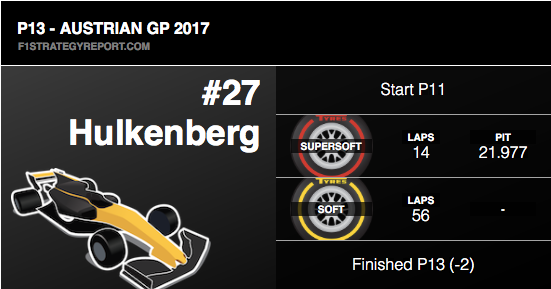 This was because the tyres at the Red Bull Ring were incredibly durable, and there was little difference in terms of grip and speed. 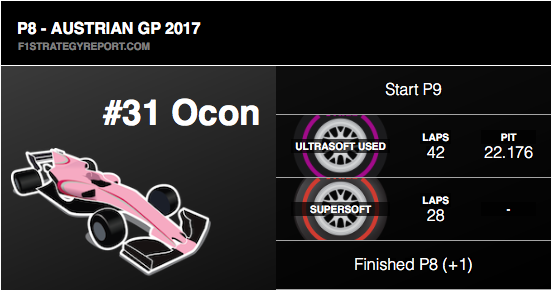 In fact, it was the closest we’ve seen the three compounds in terms of performance all year, and this meant the ultra-soft wasn’t the only strong option. But, as the one-stop race ruled the day, we saw a fairly standard strategy from most drivers – pitting between laps 30 and 44. 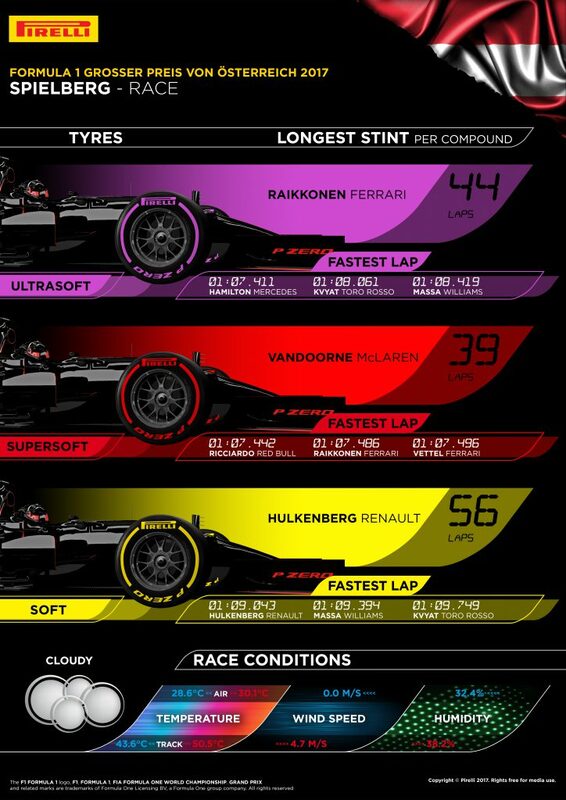 Proof of how durable the tyres were is in the longest stints completed. 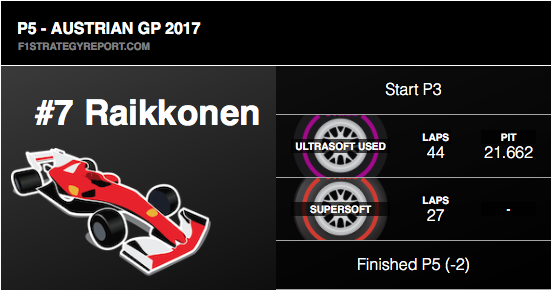 On the softs, it was 56 laps (Nico Hulkenberg), on super-softs 39 laps were managed (Stoffel Vandoorne) and a monster 44 laps (Kimi Raikkonen) were done on ultra-softs. We don’t often see drivers struggling with tyre blistering on these new Pirelli tyres, but it happened quite a lot during the race in Austria. It didn’t impact performance too much, although it did mean a few drivers struggled for a brief while, but it was definitely a factor and probably concerned a few strategists on the pit wall. Due to the warm and sunny conditions on Friday, teams thought the soft tyre was arguably the best performer in terms of pace and durability. It’s got a high working range, but the milder conditions the rest of the weekend suited the lower working range of the super and ultrasofts, which sparked a bit of uncertainty on which tyre to go for. 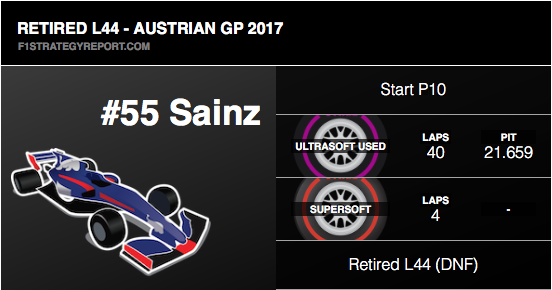 The starting grid is usually made up of two of the three tyre compounds, but that wasn’t the case in Spielberg. All three compounds were used for the start, with a couple of drivers (the most high-profile being Lewis Hamilton) opting for super-softs and Felipe Massa opting for softs. It was interesting to see all three being picked, and just goes to show the close performance and durability of the compounds. There wasn’t a massive amount between them, and this meant all three were more widely used during the weekend – whereas, quite often, the hardest tyre is left unloved. 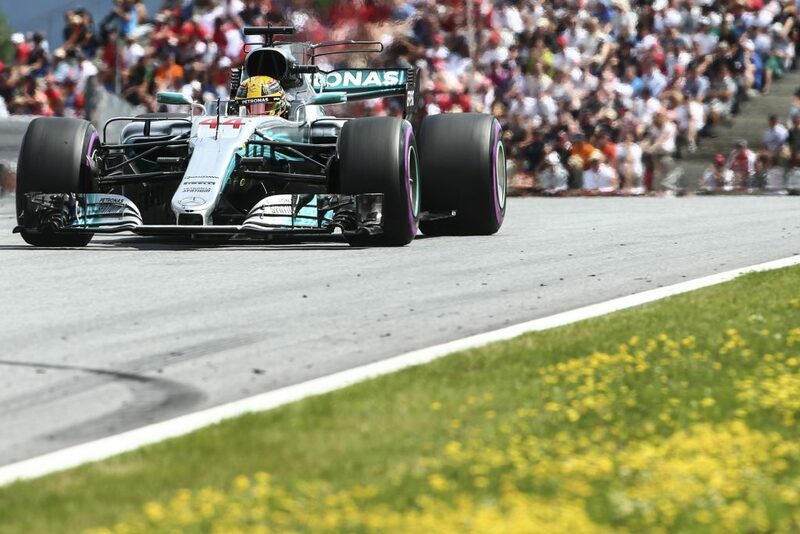 Knowing that Hamilton had a five-place gearbox penalty before qualifying meant Mercedes could do something different and get the British driver to set his best Q2 time on the super-soft tyre. 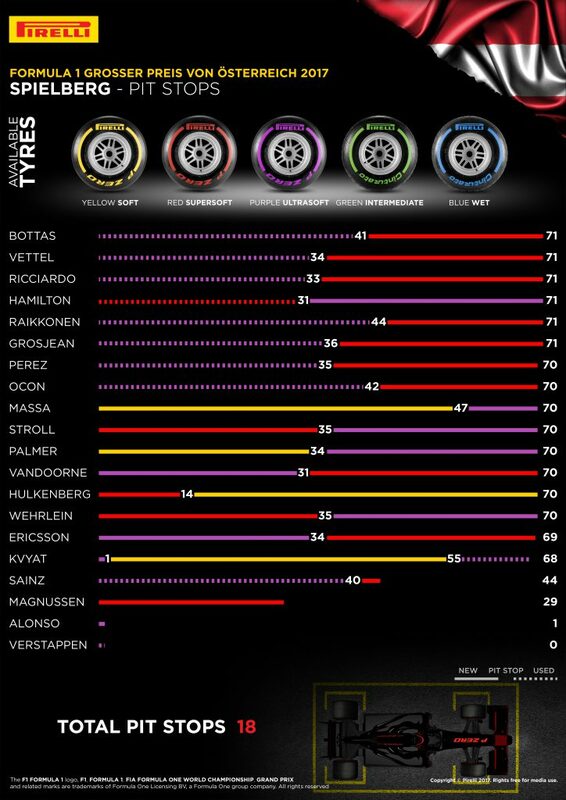 The leading teams have such an advantage that there was no real risk of Hamilton not making it to Q3 on super-softs, and the tyres were closely matched in terms of performance. 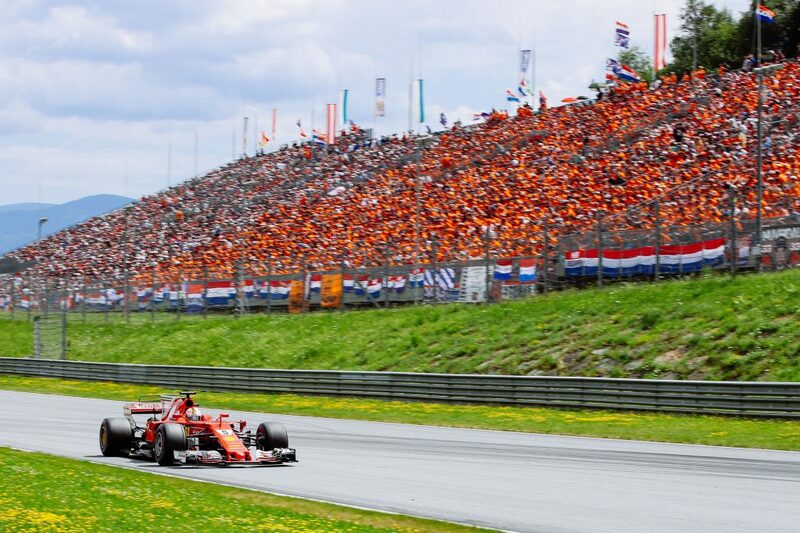 This meant that Hamilton had slightly less performance for the first stint, but as he was racing with cars slightly slower than his own, it wasn’t an issue. 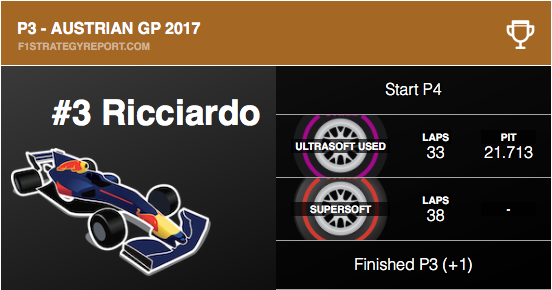 He was able to go a little longer and the tyres held up enough for him to make up ground in those final laps, before a final stint on the more grippy ultra-softs which allowed him to attack Ricciardo for third in the end – he just missed out on a podium. Ferrari appeared to keep Kimi Raikkonen out longer in his first stint, giving him the lead and attempting to slow down Valtteri Bottas – who had emerged behind the Finn on fresh tyres – and allow Sebastian Vettel to catch up. But, his tyres weren’t in great shape by that point and the Iceman failed to pull off the strategy call. So, it didn’t really work. The start and first lap pretty much secured the results they scored for many. Bottas got a perfect start, so good the FIA investigated him for a jump start before taking no further action, and this allowed him to establish a gap and control the pace. Behind, Daniil Kvyat smashed into Fernando Alonso and Max Verstappen, with the two drivers spinning around being forced to retire. 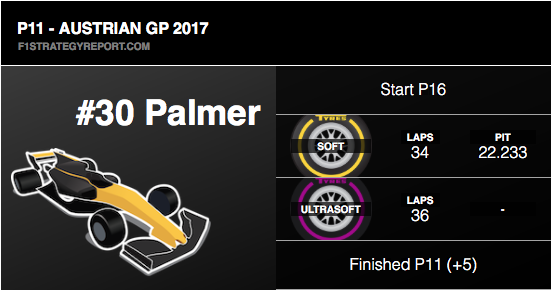 Williams moved from the second-last row into the points due to the first lap and Jolyon Palmer also made up ground, so this was their gains came from, rather than strategy. 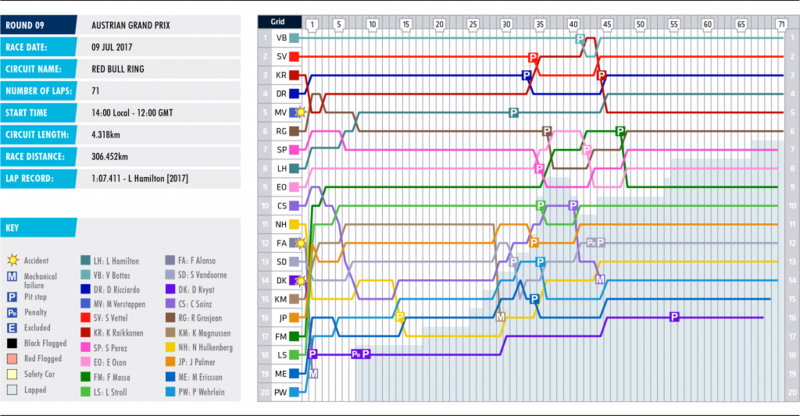 A few drivers made up more ground than others and this meant they were able to elevate their positions without the intervention of strategy. Hamilton was able to close on Ricciardo late on due to the slightly better performance of his ultra-softs and the general pace of the Mercedes. 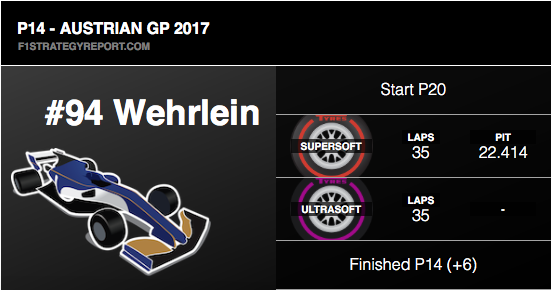 This meant it was a tense final few laps but he ended up just missing out, losing some time from a failed pass on the penultimate lap. 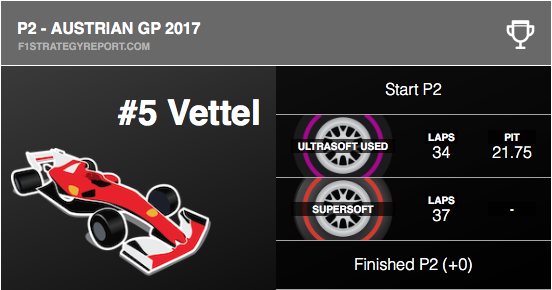 We saw once again that the Ferrari seems to treat the softer compounds a bit better and while Vettel stopped before Bottas, his tyres seemed in better condition towards the end and the car has always gone well on super-softs. He closed the gap fairly quickly as Bottas appeared to struggle a bit, but he couldn’t get close enough to make a move and ran out of time.